Rain was coming but I headed outside anyway, behind the rain clouds was sunshine pushing through. Thanks to the weather pattern, double rainbow soon followed. We're in the rainbow season again. Last week a broken storm was passing through the valley. The rain was falling to the left of me and the sunlight was coming from the right. All helping to produce a rainbow back of Lake Minnewanka. For few kilometers I was seeing part of this double rainbow as I was driving, thinking where I could stop to take its picture. I decided it was going to be at Hillsdale meadow, where others were busy taking pictures of fireweed flowers that were blooming in large amount, thanks to the prescribed burn this spring. 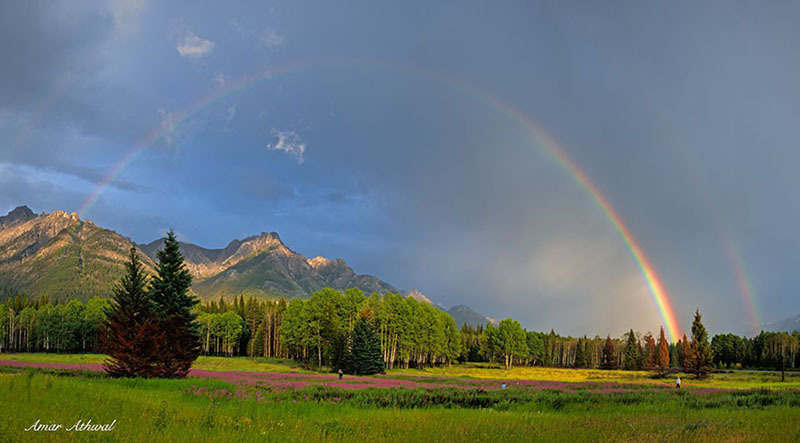 But I was looking at the big picture, flowers on the ground, the Sawback Range in the background and double rainbow in the sky. Few weeks back I was traveling in my car with rain falling. As I looked ahead, the sun was trying to push through, so I had a quick look back and could see part of a rainbow. I quickly found a place to park and got the camera ready in the car as to avoid getting the it wet. Then stepped outside and grabbed few pictures of not one but two rainbows. Was hoping for a full rainbow but it started to clear, so happy to get what was there. It looked as if the rainbow was coming from the peak, shooting it into the air. It lasted for about ten minutes, enough time to grab few good images.